Over the past decade, online business or eCommerce has developed and grown exponentially, and it continues to grow at a rapid rate, nearly 10% every year. This growing eCommerce market gives global exposure to the businesses as they are not restricted to a particular city, region or where they are physically located. With this global exposure, businesses have started selling to other businesses as well as directly to the customers. However, up until some time ago, these two markets were kept separate because of the stark differences in the audience, kind of promotion and marketing required and other aspects. This traditional marketplace structure is changing with eCommerce platforms providing unified B2C and B2B solutions. 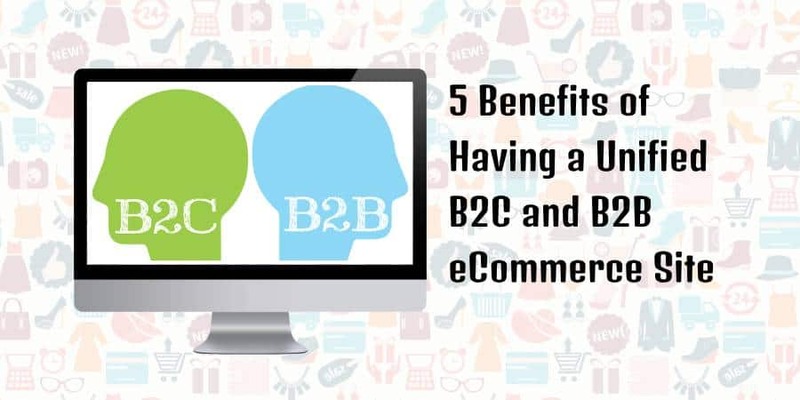 Let us look at five major benefits that your business gets from having a unified B2B and B2C e-commerce platforms. While using a unified B2B and B2C web store you have to manage only one inventory. The various E-Commerce platforms such as Magento and SAP Hybris commerce development allow one dashboard to handle all the functions singularly. One team can efficiently manage the business as all these reports would be unified. This brings down the cost of operation significantly and allows for better allocation of human resources. By having a unified B2B and B2C business, your resources remain focused on a business entity rather than being divided among multiple parts. You can focus more on the core features and, your resources will not be wasted on mundane things for each of the businesses. SAP Hybris eCommerce development platform allows for Omni-channel integration wherein your limited resources will be able to approach buyers on various platforms. A unified B2B and B2C mean that you require only one Web Store to sell your products. Since you have one web store you only need to hire the eCommerce development team and pay for the features only once. In the case of Magento, Magento eCommerce developers optimize your URLs based on SEO to draw in more traffic from other businesses and customers. This ensures that your web store gets proper attention from both the audiences. As the businesses and consumers both visit the same web store and features, you can focus on creating a brand image for yourself. This would help to promote your business and gain a larger market share as your customers would not have to be divided among multiple web stores. Lastly, you would be able to focus more on the most important factor which is the experience that your customers have on your web store. As a traditional means of marketing consumers generally got a better shopping experience than the businesses. However, the unified B2B and B2C eCommerce platforms allow you to provide the same level of experience and features to your customers without differentiating between the businesses and consumers. Web developers also facilitate personalized recommendations and shopping experience to your customers. The benefits of a unified B2B and B2C e-commerce platform are not limited to these points. It is changing the shape of the virtual marketplace and redefining norms. Experts believe that businesses who take up the unified approach have more chances of survival and success than those who do not.